UPDATE: this exhibition CLOSED in late 2014, nearly coinciding with the opening of a new permanent exhibition at the Stasi Museum in early 2015. Apparently (parts of) the former Stasi exhibtion at Zimmerstraße has been passed on to the Bautzener Straße Stasi prison memorial in Dresden. Not sure if that means the text below will have to be moved to the lost places section now ... For the time being I'll let it stand, just for reference. A sobering exhibition in Berlin about the infamous former GDR secret service Stasi documenting the despicable and at the same time often ingenious methods employed to keep the population submissive, under very tight control and under constant surveillance. 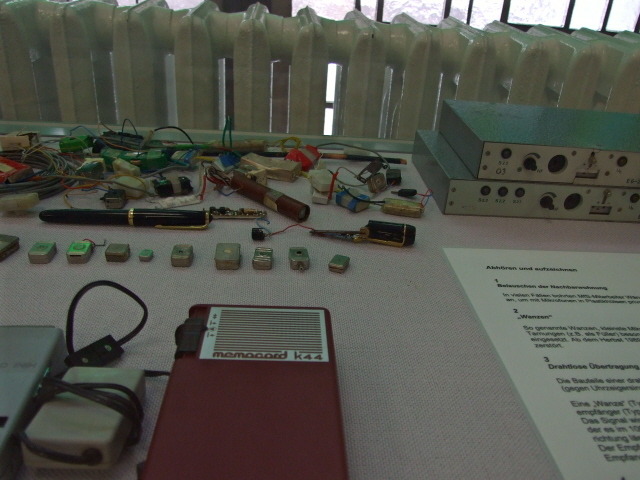 More background info: for general info about the Stasi and its evil work see also under Stasi Museum! – this exhibition in the centre of Berlin, right in the former GDR government quarter, now FGR, had been in place since 1998. 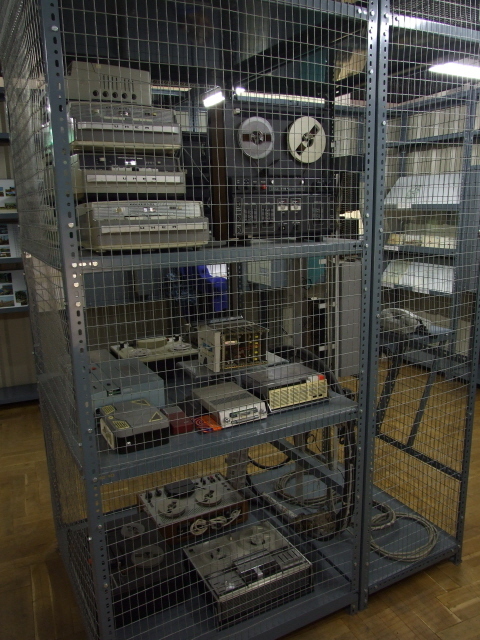 It served as one of the main Information and Documentation Centres (IDZ) of the "BStU", the official government body responsible for the hundreds of tons of files left by the former GDR secret police. The analysis and management of these is the main concern of the BStU, but it also has a remit for providing overarching information to the general public. 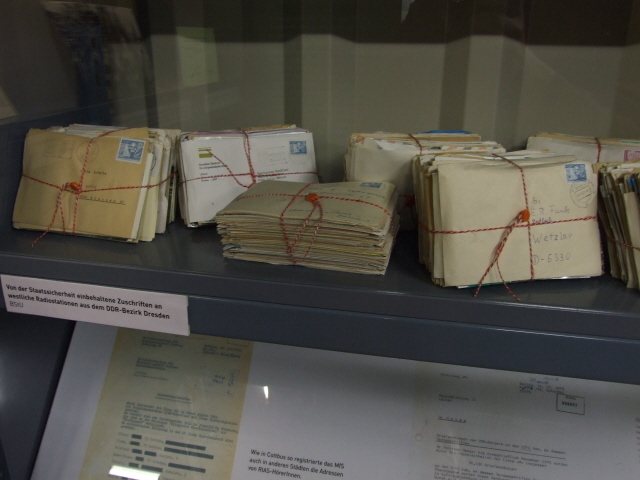 To this end, the Stasi exhibition ("Stasi – die Ausstellung" in German) was set up. Until the end of April 2010, tens of thousands of visitors made use of this service. Ironically, though, the need for renovation of the GDR-era building that the exhibition was housed in forced it out (not even the buildings of the former GDR appear to stand the test of time). And a new exhibition has been opened in its stead at a different location in Zimmerstraße from January 2011. The news bulletin issued by the BStU just before the move already suggested that the new exhibition might be of a reduced format (it talked of "konzentrierte Form" – 'in a compact format'), even though the original was spatially already rather compact. Since I have seen the new exhibition myself (in November 2011) I can confirm that there is indeed a lot less to see. Moreover, the new commodification is of a totally different nature: much more design-oriented and with a strong focus on just a handful of selected individual stories of Stasi victims. 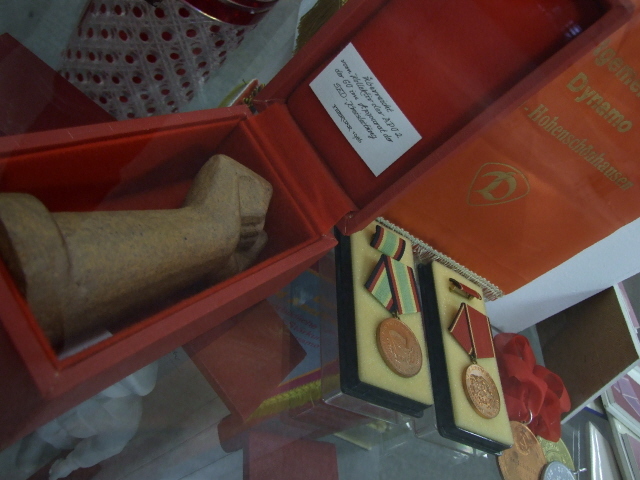 But artefacts on display are now only a few. For the foreign visitor it is good news to find that the new exhibition now features translations into English of at least part of the texts displayed (still not all) – and that audio-guides in a range of languages are now available. 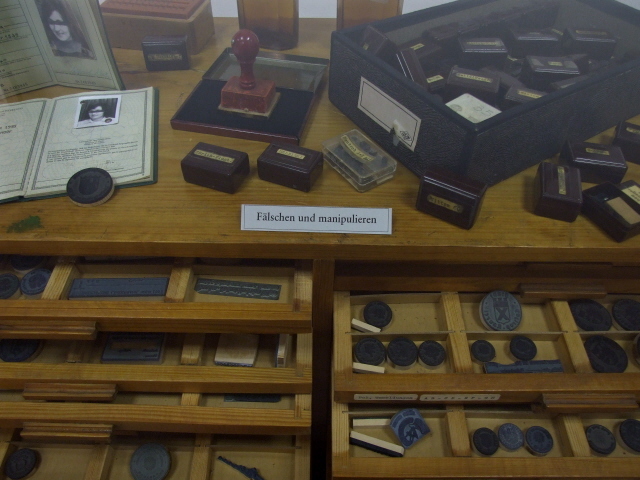 In the past, at the old exhibition, this was a severe drawback for international visitors: all labels were in German only with no English (or other) translations – in fact there were many entries in the guest book criticizing this. However, if you asked at the counter by the entrance you could be handed a text folder of 42 pages with English translations for selected exhibits and thematic sections. Though not complete, it was still a great help. Now, there is no need for such a roundabout approach any longer. Personally, however, I regret the fact that the new exhibition has been so drastically reduced in the number of artefacts that are on display. I also find the didactic nature of the new commodification a little too much, too "politically correct" and too heavy-handed on the role of arty design. I liked the "roughness" of the old exhibition ... and didn't mind that it was in German only. But I do understand that such a change in commodification strategy was probably inevitable from a general perspective, and especially given that an expected majority of visitors in future years will be of a younger generation as well as more and more foreigners. Further into the future, it is (or at least used to be) planned to move the exhibition again to an "original" location – it wasn't quite clear, but from a BStU news bulletin issued in 2010 it seemed like it would not be back at the old location, but rather at the Stasi HQ centre at Normannenstraße ... where the "Stasi Museum" is located already – maybe the two institutions are/were to merge? The talk of a move to the location "at former Stasi head Erich Mielke's office" could suggest this. For now, however, there is no longer any mention of such plans at the new exhibition or on its website. So maybe the new exhibition at Zimmerstraße will become a permanent fixture after all? We will see. If I find out more I will post it here. What there is to see: UPDATE: the exhibition is CLOSED! The text below is this redundant now. 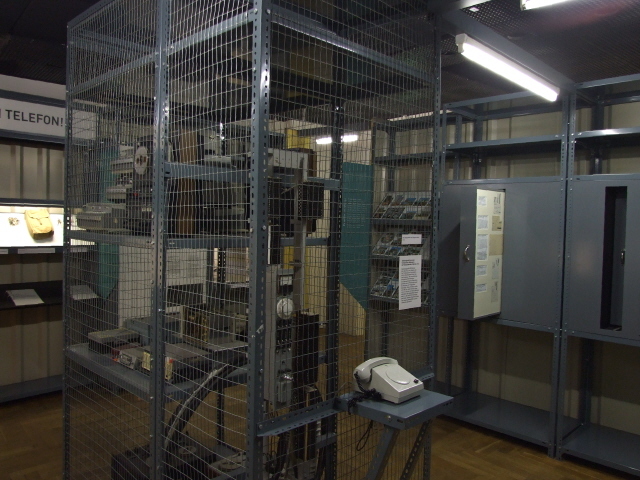 The exhibition is housed basically in two (and a half) rooms – a front room with an information desk and a smaller part of the exhibition (possibly an auxiliary temporary one) with a focus on how the Stasi even reached Western citizens. Walk through a kind of connecting or ante-room painted in a way vaguely resembling endless shelves of files and a single original object (a semi-automated card filing cabinet) and you get to the exhibition's main hall. Here the theme of the exhibition is subdivided into several blocks, taking in e.g. the inner functioning of the Stasi and its wide reach (basically the whole of the GDR's society – and even beyond into missions abroad), its strategies and main targets (churches, youth, culture, sport, etc.). A particularly dominating feature, both visually and in thematic emphasis, are the six selected personal case studies of individual Stasi victims. Each story is given a strange kind of horse-shoe-shaped green fabric/upholstery ring roughly at eye-level height. On the outside a portrait drawing and text info for each case is given. You then step into the horse-shoe ring to get to the details on the inside, relayed by small video screens, texts and a few more or less representative artefacts. 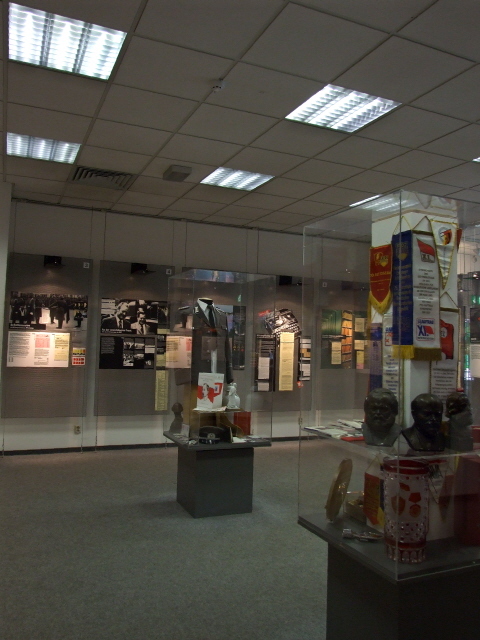 The rest of the exhibition consists of display cabinet boxes and, along one wall, large-scale text-and-photo-panels. 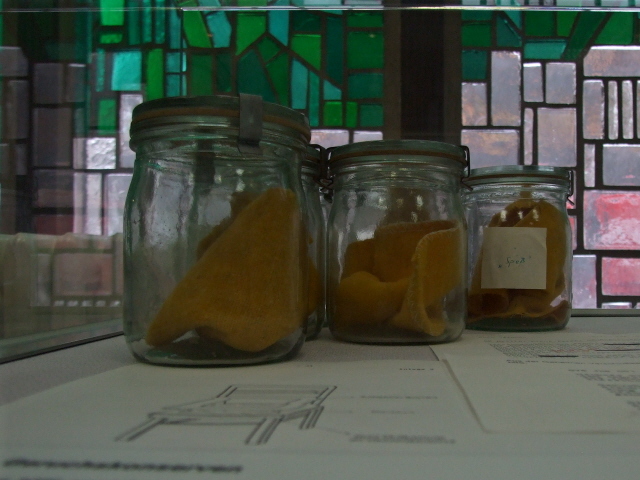 Original artefacts to be seen include some espionage and listening equipment, Mielke's "red briefcase" (in which he apparently hid compromising documents about Erich Honecker – just in case) and – most infamously – jars with pieces of cloth in them that served as "scent samples" (taken from political enemies or suspects, retained for future tracking down with the help of sniffer dogs!). Big Brother was not only watching, but also tried sniffing people out – quite literally! The new exhibition is in German with general text translations into English. But many documents and labels remain in German only. However, you can now hire an audio-guide in English (or French, Spanish or German too) to take you through the exhibition. I did not personally inspect the latter, however, but they should be of great help. Also in the front room, there are various publications for browsing and for sale too – although a fuller range can be found both at the visitor centre at the Bernauer Straße Berlin Wall memorial site and, in particular, at the Berlin Story shop. Location: In the middle of Berlin's centre – at its new address: Zimmerstraße 90/91 (NOTE that some older references still give the previous address: Mauerstraße 38, which is no longer current! ), a mere 150-200 yards west of Checkpoint Charlie. Access and costs: easy to locate (but check for changes! ), free. UPDATE: the exhibition has CLOSED for good! Details: the new location is on Zimmerstraße, just round the corner from the Museum at Checkpoint Charlie and all the commercialization that surrounds it, so it's easy to find (easier than the previous location, where the entrance was a bit hidden). The nearest metro station is Kochstraße (U6). From its northern exit walk up Friedrichstraße to the corner of Zimmerstraße (and Checkpoint Charlie) and turn left – the exhibition is on your right. Opening times: daily 10 a.m. to 6 p.m. now permanantly CLOSED! Time required: the present exhibition in its new location is a lot more "compact". The previous one, though not taking up much area space, was quite rich in information and I spent a fairly long time in it – ca. an hour and a half, if not longer ... but I had the advantage of being able to read the German-only texts. The new exhibition will typically take probably less than half that for most visitors. Combinations with other dark destinations: the new location is virtually next door to Checkpoint Charlie with all its commercialization (very much in contrast to the sober Stasi exhibition), from where – a couple of hundred yards to the west along Zimmerstraße – a few other Berlin Wall relics are also accessible, as well as the new Topography of Terror. Further up Friedrichstraße, the 'Berlin Story' shop and exhibition provides a good source of background material as well as an introductory exhibition on Berlin's history. Those with a nostalgic penchant for Trabbis (the quintessentially iconic GDR designed little car, called Trabant to give it its full name), can find a new "TrabiWorld" just to the west of the Stasi exhibition (also on Zimmerstraße en route to Wilhelmstraße/Topography of Terror), which sports a "Trabant museum", a "Trabi Lounge", a souvenir shop and the possibility of going on a "Trabi safari" around Berlin. For more (serious) dark sites further afield see under Berlin in general. From a thematic point of view, of course, two stand out: the topic of the Stasi and its evil works can best be further explored in more depth and with much greater dramatic effect at the Stasi Museum at its former HQ at Normannenstraße, where you can even visit main man Erich Mielke's office and private rooms. And at the former Stasi remand prison at Hohenschönhausen former inmates conduct guided tours that give you an intense first-hand account from a victim's point of view. Combinations with non-dark destinations: see Berlin.